Students in a Master of Social Work class. St. Scholastica has been awarded $1.33 million by the federal government to offer stipends to graduate clinical social work students. 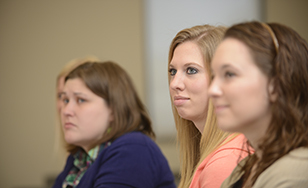 Qualifying students will be committed to working in rural clinical settings in northern Minnesota and focusing on integrated behavioral health, an emerging trend that connects patients' health-related habits with their symptoms and diagnoses. St. Scholastica's Master of Social Work program will use the support to found The Rural Optimization of Behavioral Health for Underserved Settings and Trainees (ROBUST) initiative. ROBUST will include collaborations with partner agencies to develop new and enhanced field placement for the St. Scholastica social work students, as well as delivering training in cultural and linguistic competence and integrated behavioral health. Interdisciplinary training will ensure that high-quality behavioral health services are available to communities in need. The Health Resources and Services Administration of the U.S. Department of Health and Human Services made the award. St. Scholastica will receive $333,299 each year for four years. "The ROBUST integrated behavioral health initiative will play a critical role in developing and expanding the behavioral health workforce serving in rural and medically underserved areas of Minnesota," said Lee Gustafson, chair of Social Work at St. Scholastica. "There's a great need for clinical social workers in these settings." Mary McClernon, Adult Behavioral Health Manager for Essentia Health in Duluth, said the ROBUST program is extremely valuable and she is glad to have Essentia participate through field placements for the students. "Integrating behavioral health into the primary care setting is a truly important trend," McClernon said. "The ROBUST program will graduate clinical social workers who are ready to meet that kind of health care need. They will be very well trained." When behavioral health is integrated into primary care, patients/clients' needs are met more effectively, Gustafson said. The patient can receive comprehensive care in one visit, leading to better outcomes. In addition to stipends to support the Master of Social Work students' studies, the ROBUST project also provides for mileage and books expenses as well as licensure fees. The grant will also cover curriculum development and faculty development. ROBUST will have an interdisciplinary component as well, involving St. Scholastica's Physical Therapy, Occupational Therapy and Physician Assistant programs. In addition to Essentia Health, St. Scholastica's ROBUST initiative will collaborate with the Duluth Vets Center, the Human Development Center in Duluth, the Leech Lake and Fond du Lac bands of Ojibwe and St. Louis County Social Services.